While we may not all collect stamps, it’s always fun when an interesting or attractive stamp catches your eye. Poet-themed stamps are a great way to share the importance of poetry and America’s literary heritage with the entire country. Langston Hughes, Emily Dickinson, and T.S. Eliot are a few of the poets who have made their way onto a postage stamp and into the mailboxes of people everywhere. Help promote poetry by writing a letter requesting more poet stamps. To be eligible, suggested poets must have been deceased for at least ten years and must be American or of American descent. Read more about the Citizens’ Stamp Advisory Committee and the stamp selection process online. It's National Poetry Month! 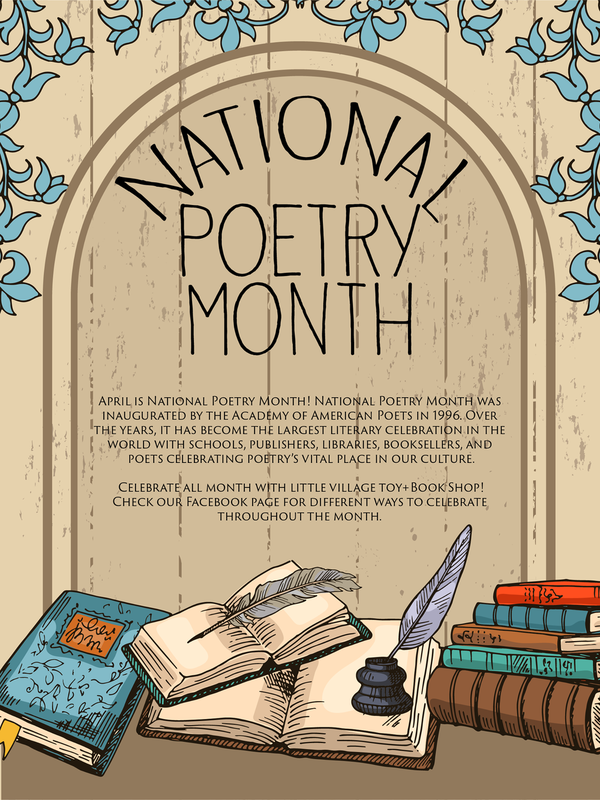 Little Village Toy & Book Shop, with the help of the Academy of American Poets (www.poets.org), will be posting different ways to celebrate poetry throughout the month of April. Let's start by memorizing a poem. Select a poem from the book you’re reading, or an old favorite, and begin to memorize it. While memorization may seem like a relic from your school days, the rewards of recalling a private anthology of well-loved poems are both immediate and long-lasting. If you are new to memorization, pick a short poem with a strong rhythmic underpinning. Rhythm has long been used as a tool to aid the memory, particularly by oral storytellers before the advent of the written word. By choosing and memorizing a poem that you love, you connect yourself to this long tradition of passing along stories and customs through the power of poetic language. Make sure that you understand the sense of the poem—this will give meaning to the rote act of learning each line and transform a string of sounds into a message that you can easily absorb and transmit. Browse our poetry section at Little Village Toy & Book Shop to find the perfect poem to memorize.